The years do indeed fly by. Nonetheless, there can be no denying two decades have past since Michael Donnellan, Ja Fallon, Padraic Joyce, Kevin Walsh, Tomas Mannion, Derek Savage, Martin McNamara and Sean Og De Paor made their mark in Connacht, before going on to impress all and sundry with their class and talent in Croke Park when beating Kildare in the All-Ireland final and breaking a 32 year famine. Last weekend’s reunion at the Galmont Hotel was an occasion to acknowledge those heady days and relive some glorious memories. 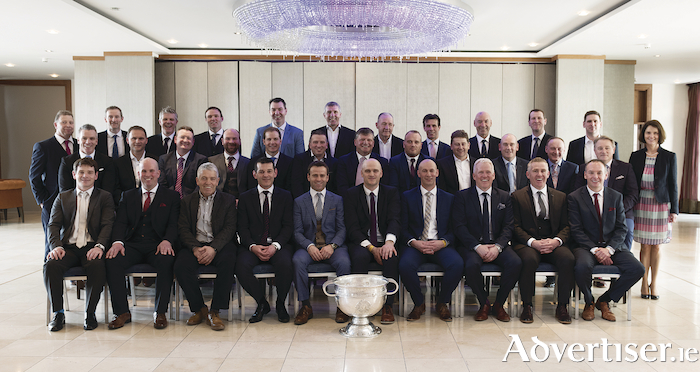 The day gave panel members, their families and some very loyal supporters of Galway GAA a chance to meet up and swap some old war stories and check in with each other regarding how their life journey is going. It was great to meet up with guys such as Robin Doyle who is based in Donegal, and Neil Finnegan, Padraig Boyce, Mossie Meehan and Fergal Gavin who are all based on the east coast. Often in life, we are too busy hurtling forward to our next adventure or our next work, sporting or family commitment, rather than taking a day or two to look back at achievements from the past and reflect on good days that were had with friends, family and teammates. Sometimes it is better to have great memories, than great dreams. It was also a day that people spoke with fondness and high regard about men and women who are no longer with us, such as Miko Kelly and Pat Egan from the football board, Dympna Burke and Freddie Creaven from the Galway supporters club, and other famous GAA people such as Joe McDonagh and Enda Colleran. As one wag said about our 1998 panel – “at least ye are all above ground” – and hopefully the same will be true in another 20 years. The day would not have happened without the incredibly hard work of the Tribesmen supporters club, with support from John Lally from the Galmont Hotel and Mick Culhane of Murray and Spelman insurances. With a bit of luck on the field of play over the next few years under the guidance of Kevin Walsh and his backroom team there will be a necessity for another such functions in 2039, 2040 or 2041 and player’s names such as Comer, Conroy, O’Ceallaigh, Walsh, Silke, Kelly, Armstrong, Heaney, Daly, Brannigan, Burke and Bradshaw will be recalled as the men who broke the dearth of All-Ireland success since 2001. Based on what we have seen over the past few months, and if every player who is good enough commits to the common cause, that is not beyond the bounds of possibility at all.